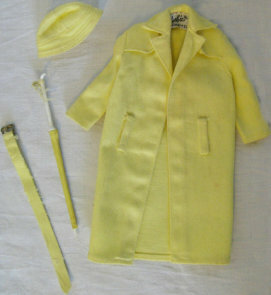 Click the Barbie Doll link above to take you to all the Mod Barbie Dolls in the vintage line! The term “mod” is short for “modern” which was exactly what these girls were back in 1967 when the first mod Barbie was introduced. She was named the New Barbie twist n’ turn doll. To present the new line, Mattel had a “trade in” promotion, which was just trading in an old doll along with $1.50, and you would receive a brand new twist ‘n turn Barbie. The old dolls were given to Charity. The twist n' turn doll had long straight hair, new make-up, a new head mold, and a brand new body! These dolls and her fashions were inspired by the youth of America as well as the styles of Great Britain. As we all know, some of the best music came from there and of course within the music world, fashion always follows! Barbie now looked younger and more hip! Pop culture was now a huge part of Barbie! Between 1967 and 1972 there were many Barbies released. Click the Barbie Doll link above, to see all the different "Mod" Barbie dolls in Mattel's line.